In 2018 the WRP and Vermont River Conservancy conserved 9 acres of river corridor along the White River through a river corridor easement project in Gaysville. Tropical Storm Irene flood waters deposited large amounts of sediment on this undeveloped property, which highlighted the need to keep the property undeveloped to accommodate future flooding. 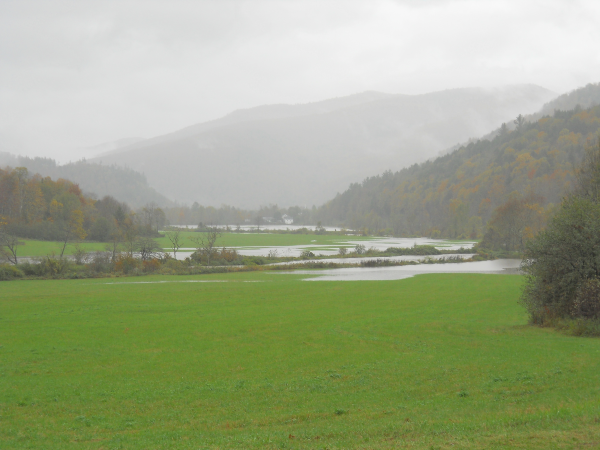 The Vermont Ecosystem Restoration Program and High Meadows Fund provided funded for the project. The WRP works with the Vermont River Management Program to conduct a 3-step river corridor planning process in the White River watershed. In step 1 the WRP hires a private consultant to conduct Phase 2 stream geomorphic assessments. These on-the-ground assessments allow groups like the WRP, as well as towns and regional planning commissions, to increase our understanding of the current physical condition of a particular stream and the various land uses affecting it. In step 2 the consultant analyzes the data to identify municipal- and landowner-scale projects that protect and improve water quality and flood resilience. The WRP coordinates public meetings to share the data analysis results, and to invite feedback from the local community about their interests and concerns. River Corridor Management Plans are the end result of the river corridor planning process. These documents guide step 3: restoration efforts that both address underlying causes of instability as well as the concerns of the local communities. Visit our Reports page to access links to River Corridor Management Plans completed since 2007. The WRP works with its partners to implement river corridor protection projects that reduce conflicts between the river and the land alongside while improving water quality, fish & wildlife habitat, and flood resilience. Municipal-scale river corridor protection projects include floodplain bylaws that restrict development in FEMA-mapped floodplains and Phase 2-mapped river corridors. Most White River watershed towns have adopted floodplain bylaws that restrict development in FEMA-mapped floodplains in order to participate in the National Flood Insurance Program; only a few watershed towns restrict development in the mapped river corridor. Vermont has created an incentive for towns willing to adopt river corridor protection measures. The Emergency Relief and Assistance Fund (ERAF) provides State funding to match Federal Public Assistance projects after federally-declared disasters. Eligible public costs are reimbursed by federal taxpayers at 75%. For communities that take specific steps to reduce flood damage the State will contribute 12.5% or 17.5% of the total cost. The 17.5% cost-share is only available to towns who protect river corridors through their floodplain bylaws. Landowner-scale river corridor protection projects include river corridor easements, riparian tree plantings, and other on-the-ground projects designed to address issues identified in a River Corridor Management Plan. A river corridor easement is a conservation tool designed to protect floodplains identified as a high-priority in a River Corridor Management Plan – because they actively flood or because the river has been straightened and is likely to erode it banks. A river corridor easement purchases both a landowner’s development rights and river management rights within the mapped river corridor area. A landowner may continue all land use practices in the river corridor area except within a 50-foot floating buffer along the river – if the river moves, the buffer moves with it. The valuation of the conservation purchase is based on a number of factors, including the soils, the sensitivity of the river to erosion, and the land values in the county. River corridor easements are voluntary; the willing landowner receives a 1-time payment for the conservation project. The WRP has worked with the Vermont Land Trust and Vermont River Conservancy to complete 10 river corridor easement projects since 2008, conserving 157.5 acres on river-front properties in Braintree, Granville, Hancock, Randolph, Rochester, Royalton, and Stockbridge.